Open Disclosure requires clinicians to engage with patients when something goes wrong. There is a natural inclination for clinicians to want to avoid such discussions for fear of strong emotions from the patient, causing the patient distress or even loss of professional reputation. Without the correct training, these discussions may lead to patients taking the matter further. 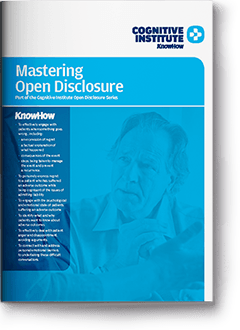 The Mastering Open Disclosure workshop takes a comprehensive approach to the difficult area of discussing adverse outcomes with patients. This workshop highlights the importance of recognising patient expectations when an adverse outcome occurs and how failing to address them increases the risk of the patient turning to other avenues for accountability. The workshop provides an overview of Open Disclosure and then progresses to providing a thorough grounding on the issues and the legal obligations and implications of these discussions. The workshop then focuses on the communication skills required to conduct these conversations and how to handle patient anger and distress. The format for the Mastering Open Disclosure workshop is short lectures, reflective exercises, small group facilitated discussions, group activities and rehearsal of skills. The Mastering Open Disclosure workshop is ideal for clinical healthcare professionals needing to support and conduct open disclosure in their organisation. Australian healthcare facilities where open disclosure has been implemented are successfully modulating their approach to open disclosure. For organisations, Cognitive Institute advocates a sustainable two-step approach. First, all staff are provided with an introduction to open disclosure. Second, a core group is trained as experts who can guide other colleagues. Their training includes simulation, role-playing and facilitated discussions. This cadre of experts can then be called upon to assist, mediate and facilitate actual open disclosure dialogue. In addition, junior staff who need to participate in an open disclosure process are provided with ‘just in time’ training either by these experts or external contractors. The core inter-professional group of open disclosure ‘specialists’ can counsel other staff when required or step in to perform open disclosure. They are also responsible for linking open disclosure to quality improvement and clinical risk management. connect with and address personal emotional barriers to undertaking these difficult conversations. 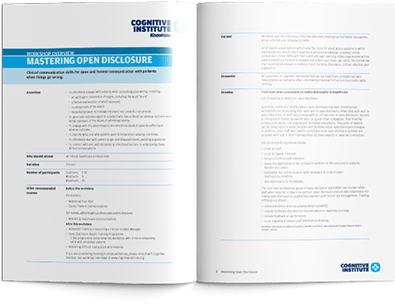 Cognitive Institute offers Mastering Open Disclosure as an Open Access workshop in various locations around Australia. Contact us to learn more about upcoming dates. Clinical communication skills for open and honest communication with patients when things go wrong.